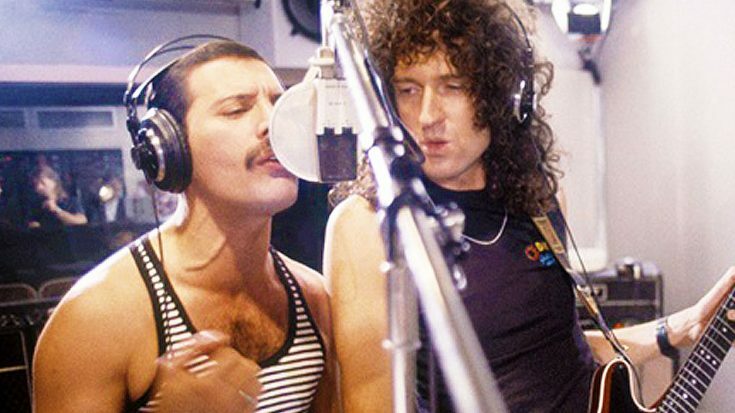 While recording a documentary on the making of Queen’s “Bohemian Rhapsody,” guitarist Brian May brought the tape containing the original recording of the song to the studio, and played footage from the raw recording of the track. It was one of the first times fans got to hear the song broken down into its first inception without all of the production surrounding it. The recording contains footage of Freddie Mercury’s piano track, Brian’s guitar solo,Roger Taylor’s drum track and John Deacon’s bass recording in their rawest forms. In addition, it also contains all of the vocal tracks the band recorded, as the song is broken down by Brian layer by layer. It’s an exclusive look into one of music’s all-time treasures! To hear the song’s layers stripped down individually is an absolute treat, and will give you a whole new perspective on the track. Brian also delves into how every member of the band was exceptional on this track, and how incredible of a pianist Freddie actually was. Freddie is more than praised for his voice, but his skill on the piano sometimes gets way overlooked! Watch the amazing video for yourself down below! We’ve created a timestamp that will take you to May playing the first of the tracks, but we will warn you that the video is a tad long. But, we encourage you to watch the whole thing, it’s worth it! Posted in Music, Stuff you REALLY should NOT miss.